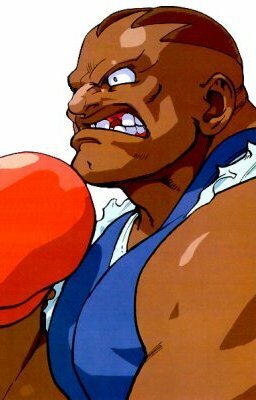 A former heavyweight champion, Balrog was banned from the ring due to his excessive violent tendancies. The dishonored champion turned to gambling and street fighting to support his vices (money and women) and quickly became known as a force to be reckoned with. Feeling he could do more, Balrog left Las Vegas and joined Shadowlaw. Originally a mere executive, Balrog worked his way up from the lower ranks and began to attract attention. M.Bison was so impressed with Balrog's strength that he made the boxer one of the Four Lords of Shadowloo. In order to make him a quicker and more powerful fighter, Bison provided Balrog with some of his Psycho Power. Balrog, along with the other four lords, became one of the Grand Masters of Bison's second World Warriors tournament. Easily defeating lesser fighters, Balrog met his defeat when Ryu nailed him with a Hadoken in the chest. Defeated once again, Balrog quit Shadowlaw and returned to Las Vegas, in the hopes of finding some other way to return to the ring. -In Japan, Balrog is called M. Bison. For more on this, click here.